CASTROL RADICOOL SF-O PREMIX is a heavy-duty, nitrite-free, extended-life antifreeze/coolant, is a premium quality, Organic Acid Technology (OAT), ethylene glycol-based fluid. Specially formulated with advanced additive technology, this product provides extended service maintenance protection in heavy duty applications without the addition of SCAs, and meets nitrite-free coolant requirements of many industry-leading OEMs. Free of phosphates, silicate, nitrites, amines and borates. Offers excellent wet sleeve liner cavitation protection. Contains better heat transfer properties than conventional coolants requiring SCAs. Eliminates maintenance with no SCAs required. Provides freeze and boil-over protection. Extended life corrosion protection for steel, solder, copper, iron, brass and aluminum. High-quality defoamer system, non-harmful to hoses, plastics or gaskets. Compatible with most major American brands of coolant technologies including conventional and Organic Acid Technology (OAT). CASTROL RADICOOL HD PREMIX is a premium quality, conventional technology ethylene glycol-based fluid. The product is specially formulated with industry-leading additives to provide optimum performance in heavy duty vehicles requiring supplemental coolant additives (SCAs). Contains nitrites for superior wet sleeve liner cavitation protection. Designed for heavy duty applications, yet can be used in automotive applications where conventional technology coolants are acceptable. Effective, long-term corrosion protection for steel, solder, copper, iron, brass and aluminum. Appropriate for use in on-and off-road diesel engines, as well as in stationary engine applications where a conventional pre-charged coolant is required. glycol-based coolant, precharged with advanced technology Supplemental Coolant Additives (SCAs). Because it is SCA precharged, Fleet Charge SCA Prechared Coolant/Antifreeze requires no SCAs at initial fill and ensures proper chemistry at every top-off. Fleet Charge SCA Precharged Coolant / Antifreeze uses a low silicate and phosphate-free formulation. Works in ALL heavy-duty diesel, gasoline and natural gas engine cooling systems. Designed to last the life of the engine when maintained with a high quality SCA filter system. Technology (OAT), globally formulated, ethylene glycol based coolant, which uses organic acid inhibitors (non 2-EH) to provide guaranteed protection for all cooling system metals. With proper maintenance,† Final Charge Global Extended Life Coolant/Antifreeze delivers guaranteed cooling system protection for ONE MILLION MILES of on-road use (8 years or 20,000 hours of off-road use) without the use of Supplemental Coolant Additives (SCAs). 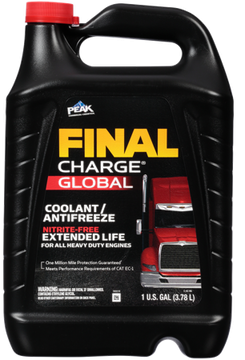 Final Charge Global Extended Life Coolant/Antifreeze is nitrite-free, phosphate-free, silicate-free and borate-free. ​† Proper maintenance requires a complete cooling system flush and fill – and subsequent topping off, as needed – with Final Charge Global Extended Life 50/50 Pre-diluted Coolant/Antifreeze or Final Charge Global Extended Life Coolant/Antifreeze and water. For guaranteed protection, no other products or product supplements may be used. antifreeze color. Its inhibitors provide maximum cooling system protection against damaging rust and corrosion. formula protects all engine metals, including aluminum, against damaging rust and corrosion when used as recommended.